I can't resist posting this. I read this on a Hungarian website (pestiside.hu) and was speechless. Those of you who know me know how I feel about intellectual property theft. This past weekend I went to an exhibit of woven fabrics at Eventuell. The artist spends 6 hours a day weaving the most beautiful fabrics! I was told it is like meditation for her-an inner calm. I completely understand what they were trying to explain to me. 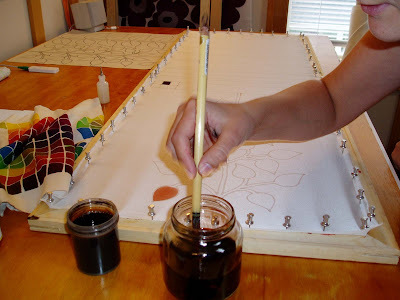 That is how I feel when I am painting silk. It seems so natural-so slow-so calming. So, today I went to my favorite online shop and bought colors, silk and dye set! WOOHOO! After almost a year of trying to convince myself that I am OK with the idea of not painting silk, I have finally broken down and decided to go back to what I love! I went to the website I use to buy from in the USA and saw that they will ship to Hungary and that everything I need to buy is allowed to be shipped. (I was a little concerned since it is all chemicals and dyes.) And they have a new product-SILK! They sell silk even cheaper than the place I used to buy it! I am so excited! I feel like a little kid at Christmas! I finally have internet! After 6 long weeks I am back! I am back to posting weekly so please keep coming back. A few weeks ago Steven and I headed to the country side to escape. We (especially me) needed to escape the city, the pollution, the noise, the busyness...and our laptops. So, we headed to Kunhegyes. A small town east of Budapest. We took a 3 hour train and arrived at a beautiful town where making lace, home-made palinka and marmalade are still appreciated! We were surprisingly treated to a lace demo by the owner of the home. I was mesmerized by her handwork. Such patience and perfection. I tried to get an estimate of how long she has worked on this one piece. The answer was “a long time”. If she worked on it 8 hours a day everyday, it would take a few weeks! There is a short movie at the end of this posting. I love that I still have prints being sold at Nordstrom! A movie from my trip to Mezokövesd. This artist picked up a can full of water and just started drawing on the dirt floor! I wish I would have had my camera ready at the beginning but I didn't know she was going to do this. 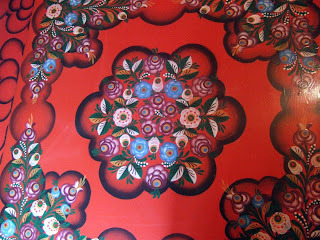 The motifs are very traditional for this region. Mezőkövesd is 150 km (93 miles) north east of Budapest. 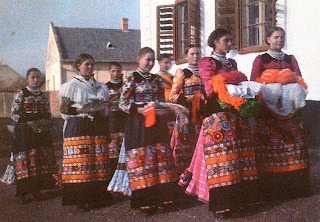 The people living in Mezőkövesd are known as Matyó. 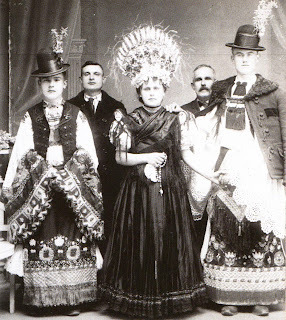 Their traditions are strong and unique. Wood carvings with beautifully designed nature motifs, handmade lace and embroidery so brightly colored it makes my heart skip a beat! We recently visited Mezőkövesd with our friends Adri and Joszef. We visited Adri’s grandmother who is a master embroider! Her hand embroidery is perfectly done-a true master! We had a fantastic traditional Hungarian lunch at Adri’s parents house - csirkepaprikas (chicken paprika), homemade pickled cucumbers and pickled salads! We feasted like kings and were treated like family. After our lunch we visited 2 museums, the machine museum and the folk museum. 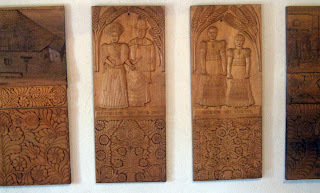 The museums were amazing and gave us a peak into what Hungarian life must have been like many many years ago. 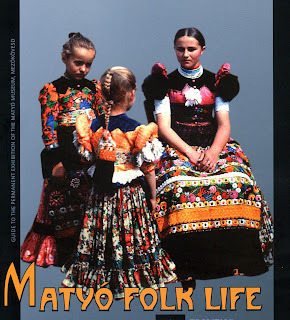 Hungarian folk arts are so inspiring to me-especially those of the Matyo people. I only wish that this was still the fashion today. with touches of blue and green! Even for MEN! The hat of a bride. So beautiful and what a statement! 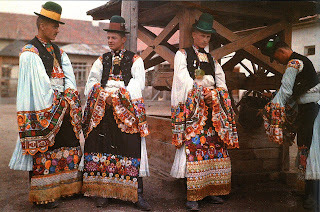 Interesting to see the men in such ornate costumes. I would find in Mexico. Wouldn’t you agree? 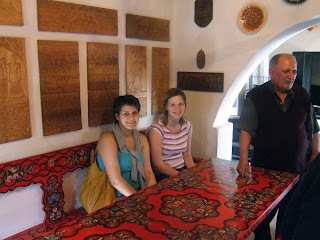 Adri, her sister and the woodcarver. 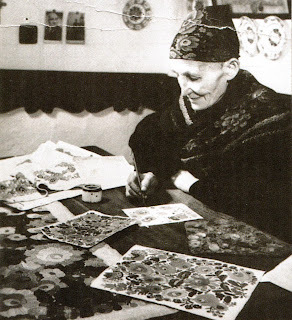 The artist created the designs that were then passed to the embroider. 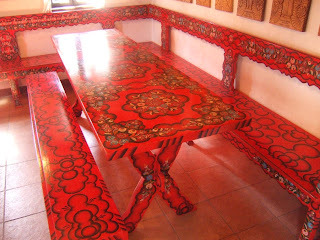 It was very unusual for the embroiderer to draw the design.